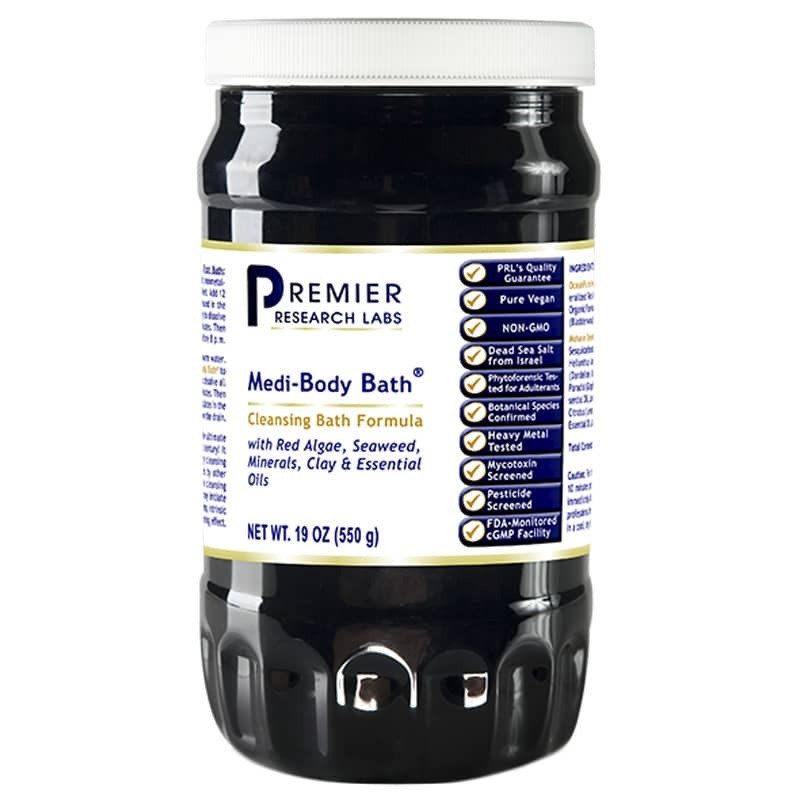 Medi-Body Bath from Premier Research Labs is a premier bath cleansing formula that features organic sea wrack, minerals, clay and essential oils. For the elderly or very sensitive people, start with 5 to 10 minutes per bath. If you feel weak or faint while in the bath, immediately discontinue the bath. Keep out of the reach of children. Whole Body Bath: Fill bath tub with warm water. With your hand, mix 2 cups of Medi-Body Bath to your bath water. It is not necessary to dissolve all the crystals. Soak in bath for 10 to 20 minutes. Then rinse off and drain tub. Residual particulates in the bath water may be rinsed down the train. Towel dry your body. Best used before 8 pm. For best results, after, the bath, spend 5 minutes or more outside to receive beneficial solar radiation. Foot Bath: Place 1 cup of Medi-Body Bath in a plastic (non-metallic) container wide enough to place your feet. Add 12 cups warm water. Swish the contents around in the water with your hand. It is not necessary to dissolve all of the crystals. Soak feet for 10 to 20 minutes. Then towel-dry feet. I've been on the Planet for six decades. After trying many brands over the past decade, finally came across the amazing PRL products and the wonderful and extremely helpful and responsive folks at Natural Healthy Concepts. I've been using PRL's detox products for about six weeks. I love the Medi-Body Bath to use for both the full body soak and the foot soak. While I'm at it, I also love the related product, i.e., Medi-Body Pack. Following the use of the Medi-Body PACK, I highly suggest to do the recommended Foot Bath (using the Medi-Body BATH powder). And while every person is different, of course, most importantly for me, these products are THE most gentle detox products I have ever used. Thank you PRL and Natural Healthy Concepts. We love Premier Research Labs'Medi-Body Bathfor both bath and foot soaks, especially right before sleep. Very gentle detox. I feel like a limp noodle after I have taken my hot bath with medibody bath. Drink plenty of water during and afterwards. Enough for 2 foot baths? Way too expensive.